Bacon | A Bit of Nutmeg! Cut 6 slices of bacon into small pieces. Sauté over medium-high heat until half-cooked. Drain fat. Add 6 teaspoons light brown sugar. Stir and continue stirring over heat until bacon bits are cooked through. Set aside to cool. Combine flour, gum, brown sugar, baking powder, baking soda, and salt. Make a well in the center. Add egg, canola oil, milk, and 1/3cup of the maple syrup. Whisk the batter until well blended. 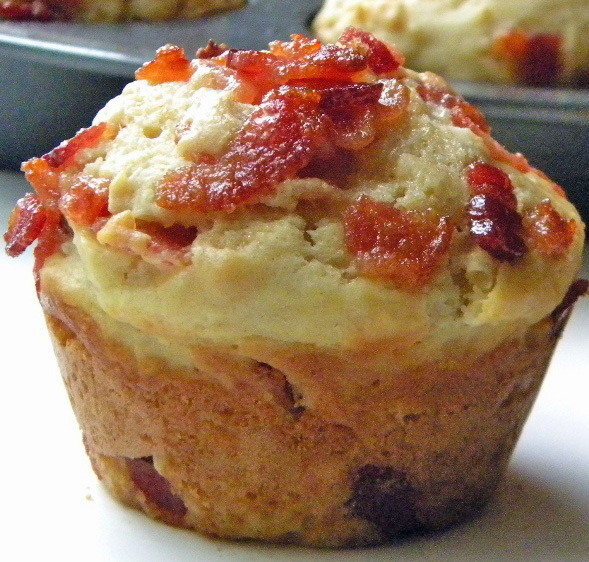 Fold in the bacon bits, reserving enough to sprinkle over the muffin tops. Coat 6 muffin cups and top of muffin pan with non-stick spray. Divide batter among the 6 sprayed muffin cups. Sprinkle the reserved caramelized bacon bits over the top of each cup’s batter and drizzle ¼ teaspoon of maple syrup on top of each muffin. Bake 15 minutes (mini-muffins: 8 minutes) or until a toothpick inserted comes out clean. 2. Cover a jelly roll pan with foil. Place a rack on the pan and coat with nonstick cooking spray. 3. Cut chicken thighs in half. Cut each bacon slice in half. 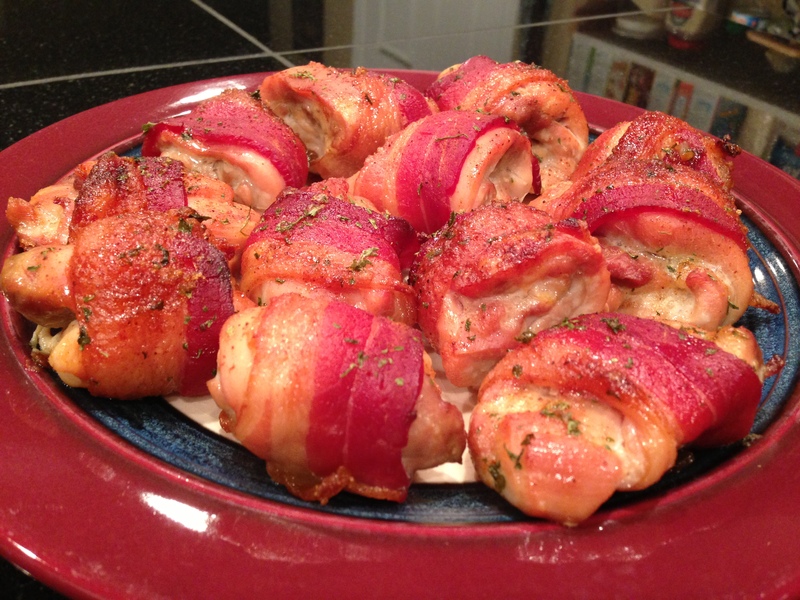 Wrap each chicken thigh with bacon and place on rack in pan. 4. Stir together brown sugar, paprika, parsley and garlic. Sprinkle over chicken and rub in. 5. Bake at 350 for 40 to 45 minutes or until chicken registers 180 degrees. So apart from not having any time (although i DID finish my very last class last nite and i take the exam tonight! YAY!) we’ve been trying to limit our grocery spending. I’ve gotten organized, and have been sticking to it and can’t believe how much money we’re saving! This is partly because it’s pretty darn expensive to start a new career, especially when you go from a steady paycheck to commission based sales, and who knows when my next paycheck will be! We also have a whole pantry and freezer full of food. So…now I look at my week and how much stuff i need to do. That determines if I’ll have time to cook or not! LOL Either way i try to pick out quick and easy recipes, that either I can do, or hubby can help out with. I’m looking forward to a little more time to get back to cooking here really soon! Another thing I look for is how much its going to make. Are there going to be leftovers?Also is the recipe budget friendly?! I use a weekly food planner to schedule out my meals for the week, determine the list of ingredients and then consult my freezer, fridge and pantry. Whatever i don’t have goes on the list. And if you haven’t downloaded a list app for your phone…do it! Oh my goodness, I don’t know how i survived without one before! LOL It’s great! I can make my grocery list right on my phone. I even programmed all the prices into it so when i make my list i know exactly how much we’ll need to spend for that weeks groceries. Then when you shop you just check it off right on your phone! No more forgetting the list on the fridge! LOL My attempt is $50 or less a week….and amazingly I’ve stuck to it, and even spent as little as $35 a week! I honestly didn’t know i had it in me! I’m the kind of girl who just buys whatever she wants…. but for now we’re on a tight budget. Hope that helps you out…its a great way to be both organized and save some money! In a large stock pot, let a dash of oil heat up. Wash and chop the potatoes, leaving skins on. Slice the green onions and separate the greens from the whites. Place the potatoes and white onion pieces into the pot and cook over medium heat 2-3 minutes. Sprinkle in the flour and cook, stirring constantly, for about 1 minute. Pour in the milk, chicken broth, thyme, parsley, salt, and pepper, stirring well. Bring to a boil over medium heat, stirring occasionally. Reduce heat to low, cover and simmer for 15 minutes or until the potatoes are tender. Add the corn, chicken, and bacon. Cook over low heat until heated through, about 5 minutes. 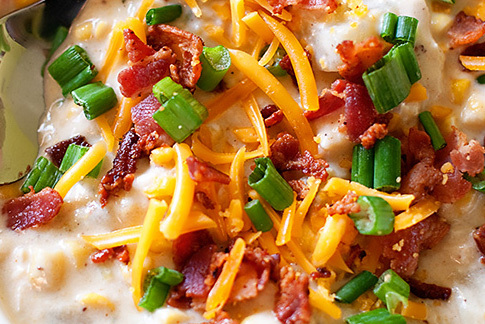 Garnish with green onions, bacon, and cheddar cheese. Mix the almond milk with 1 Tbsp of lemon juice. Let sit for 10 minutes. Combine the dry ingredients in a medium mixing bowl with wire whisk. Whisk the oil, egg and extract into the milk and then whisk into the dry ingredients until moistened. Heat a nonstick griddle to 350. Pour batter on griddle to desired size and flip when bubbles form. Meanwhile, cook your bacon/sausage and fry your eggs while you make the pancakes. 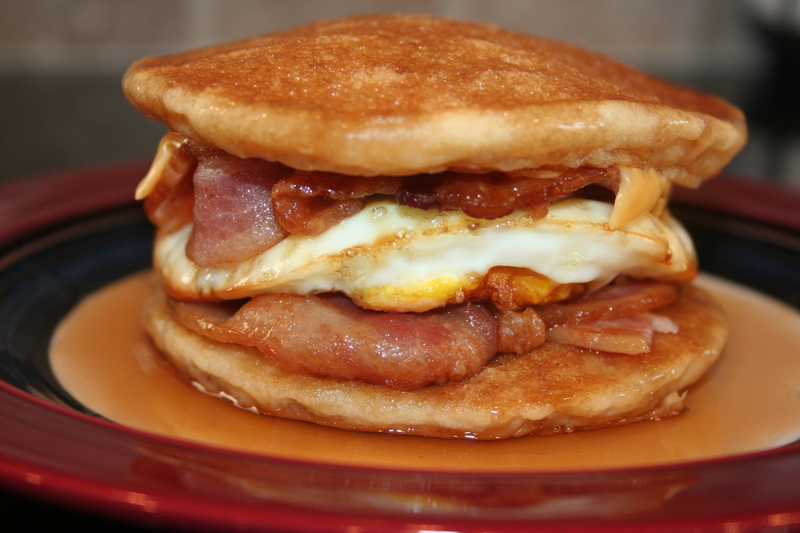 Once everything is cooked, layer your mcgriddle: pancake, meat, egg, cheese, meat, pancake and then top with maple syrup. additional fillings of your choice: sautéed vegetables, green onions, bacon, ham, etc. Preheat oven to 425 degrees. Scrub potatoes thoroughly and pat dry. Prick each potato with a fork a few times. Rub each potato with olive oil and sprinkle with salt. Place on a foil lined baking sheet and bake for 45-60 min, or until tender. Cool oven to 350 degrees. Slice a layer off the top of each potato. Use a grapefruit spoon to gently scoop out insides, leaving a thin layer of potato against the skin. Reserve scooped potato for another use. Brush inside of each potato with melted butter and sprinkle with salt and pepper. 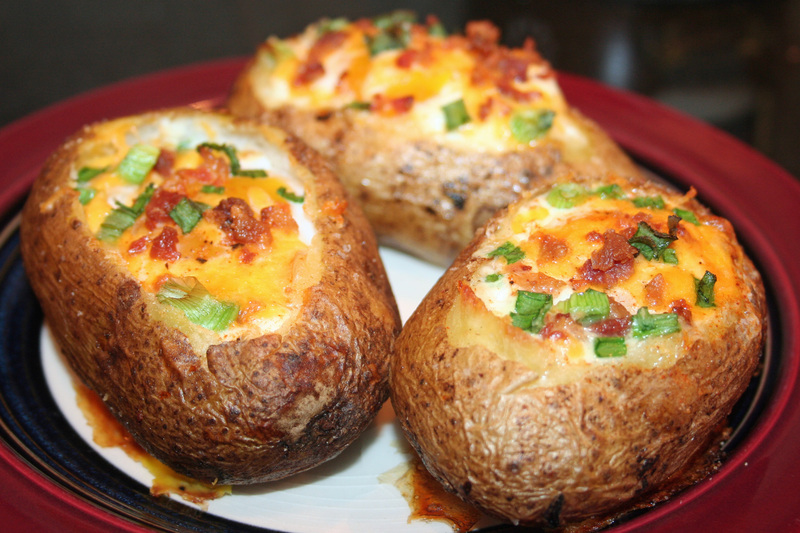 Sprinkle a layer of shredded cheese into each potato and add fillings as desired (vegetables, diced meat, etc.) Fill each potato about 3/4 full. Crack one egg into each potato. Sprinkle with a little more salt and pepper. 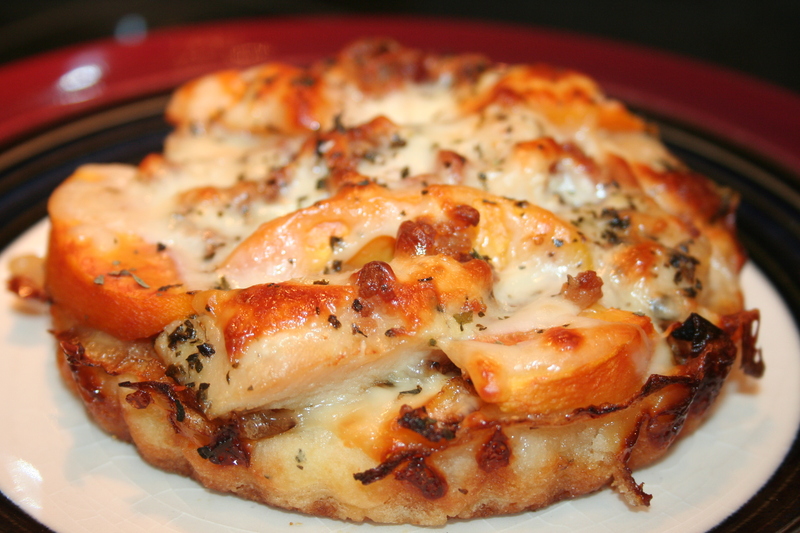 Top with additional cheese and toppings. Bake for about 30 minutes or until the eggs are cooked. 1. In a medium skillet, cook the onion until softened. 2. While the onion is cooking, combine the flour, gum, chives, baking powder, salt and pepper in a medium bowl. Stir in the milk, egg and oil, just until moistened. 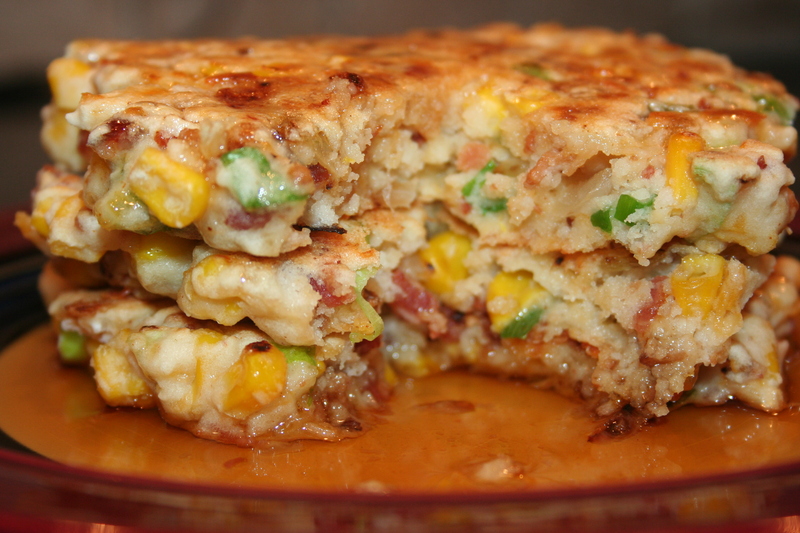 Stir in the bacon, onion, corn and cheese. The mixture will be thick. 3. Heat a griddle to 350 degrees. Pour a heaping 1/4-cup of the batter onto the griddle and cook until it is golden brown- 3 to 4 minutes per side. Repeat with the remaining batter. 4. Serve stacks of pancakes with warm maple syrup. Prepare pizza crust as directed on GF Bisquick box. Spread dough into 3 greased mini tart pans. Bake 10 minutes. Rub oil and basil onto the chicken breast and grill on a George Foreman grill on med-high until cooked thru. Cut into strips. Caramelize the onion on medium heat, add in garlic for last 5 minutes. 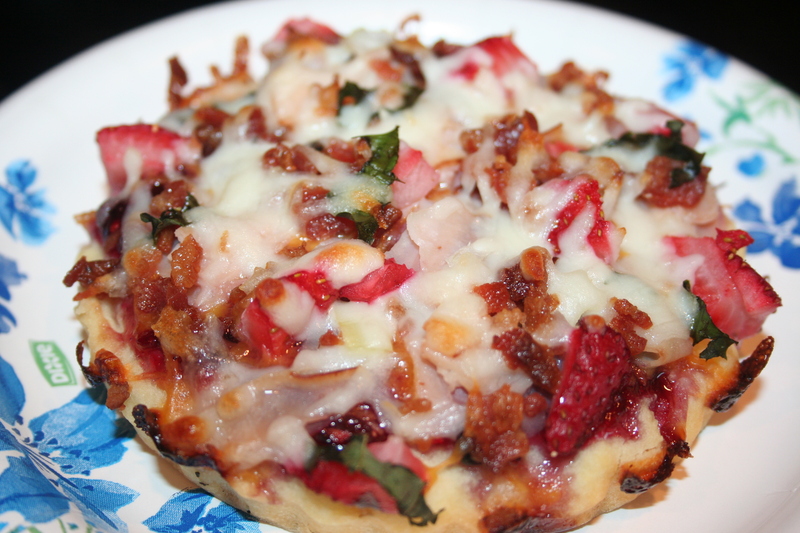 Remove crust from oven and spread with jam and half the mozzarella cheese. Add the peaches, chicken, caramelized onions and bacon bits. Top with rest of cheese and sprinkle with basil. Bake for 15 minutes or until browned. Make pizza dough following package directions. Place dough in 6 mini tart pans or 1 large tart pan (or pizza pan). Bake crust for 10 minutes at 425 F. Take out of oven and spread jam over crust. Add half the cheese, sprinkle on the toppings and top with the remaining cheese. Bake for another 10-15 minutes or until lightly golden. Remove from oven and let cool for a few minutes. Remove from tart pans. I hope everyone had a wonderful Father’s Day yesterday. 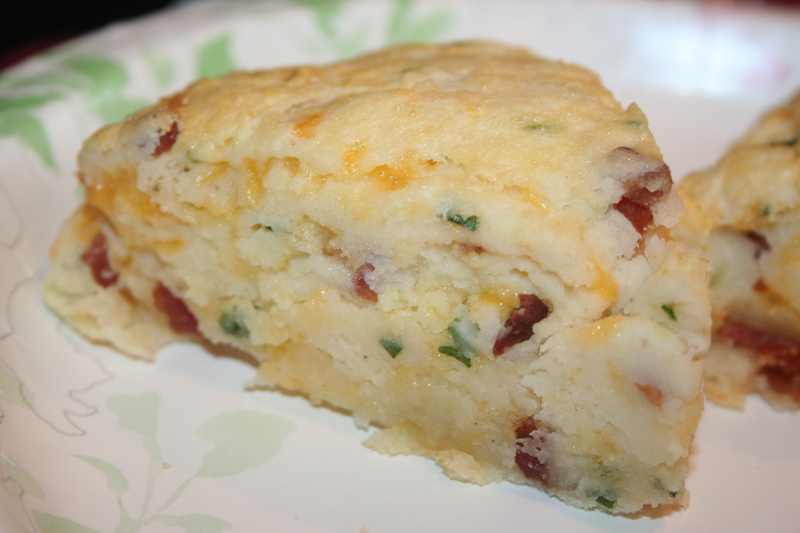 I know WE started out the day right with these amazing bacon cheddar scones! I don’t know if it’s a guy thing… but all the men I know seem to LOVE bacon, so I figured ya can’t go wrong with bacon! 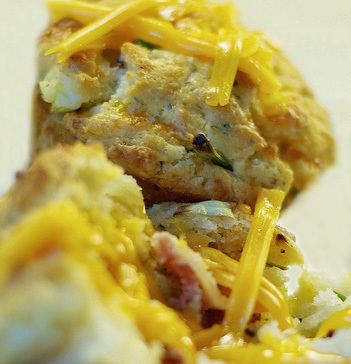 Add some cheddar cheese and put it in a handy grab & go form (scones) and what’s not to love! These were certainly a hit with hubby! (even though he’s not a daddy yet… I still like to spoil him!) I didn’t get to the rest of my Father’s Day feast (my own dad couldn’t do anything until tonight) so I’ll have some other great “man” recipes soon! Combine dry ingredients in a large bowl. Cut in butter with a pastry blender. Stir in the cheese, chives and bacon. Add the milk and stir until dough forms a ball. Transfer the dough to a parchment paper lined baking sheet and pat into a 6-inch disk. Slice the dough into 6 wedges. Brush with the egg wash. Bake at 400 F for 18-20 minutes, or until a toothpick inserted in the center comes out clean. Mix all the dry ingredients together in a medium bowl. Stir in most of the cheese and all of the bacon bits. In a separate bowl, mix the wet ingredients together, then add to the dry ingredients and stir until just blended. Spray a 6-cup muffin tin and fill evenly with batter. Bake at 400 degree F for 15 minutes. Sprinkle with remaining cheese and bake another minute longer. About Me: Living Gluten Free & Dairy Free…Deliciously!